Why should we care? Trump may extoll the benefits of nationalism, but America desperately needs loyal, determined partners right now. But the leaders of Estonia, Latvia and Lithuania told Macron an even more damning story. It seems that before they walked out to meet the media, Trump had devoted much of their private meeting to berating them on their role in the wars in Yugoslavia. (Trump’s wife Melania and her family hail from the region.) Trump rambled on about the Balkans and how terrible they were, without ever realizing that his guests were leaders of the three Baltic republics — all members of NATO and all located the opposite end of Europe. He concluded by encouraging the heads of state to try to get along with Russia, which has repeatedly threatened each of them. What could have been a sober show of international cooperation and a reaffirmation of transatlantic alliances instead became, once again, an example of America’s tarnishing reputation abroad. Macron was reportedly horrified by Trump’s gaffe and has lately begun telling the story to other visitors at the Elysées. According to Le Monde, the incident has only confirmed his view of Trump as an ignorant bully — a view that was no doubt confirmed this past weekend as world leaders converged on France to mark the 100th anniversary of the armistice ending World War I. What could have been a sober show of international cooperation and a reaffirmation of transatlantic alliances instead became, once again, an example of America’s tarnishing reputation abroad. It went downhill from there. Once on the ground in Paris, it quickly became quite clear that Trump’s attitude would be coloring much of his stay in Paris. First, there was Trump’s sudden decision not to visit the American cemetery outside Paris at Belleau Wood, site of one of the most horrific battles of World War I in which around 1,800 Americans gave their lives. The White House blamed his absence on a terrible, but it turned out non-existent, rainstorm. Scowling his way through lunches and dinners, Trump appeared miffed that he had to be there in the first place — neither valued nor the center of attention among the more than 60 world leaders who were guests at Macron’s party. Arguably, Trump was only in Paris because he had been unable to get his own Veteran’s Day parade in Washington. The Pentagon had priced at up to $92 million the extravaganza he’d ordered after watching Macron’s lavish Bastille Parade in Paris last year. But the icing on the cake was Trump’s arrival at the Sunday ceremony at the Arc de Triomphe in his own mini-motorcade, separated from the other heads of state who marched, arm-in-arm, up a heavily-policed Champs-Elysées. (This decision was due to security concerns, according to the White House.) The only other leader not to march with the rest? Vladimir Putin. While Macron and Trump were once dubbed a “bromance” in the media, the contrast between the two could not have been more dramatic during the weekend’s events. 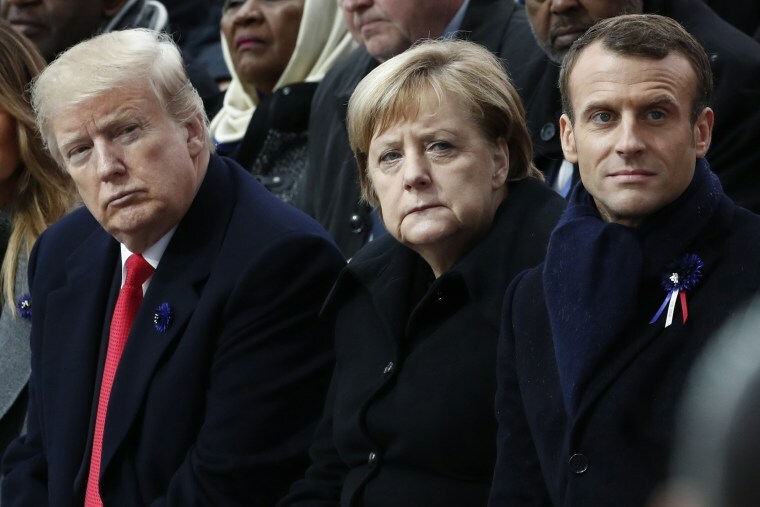 While Trump sulked in his room, Macron and German Chancellor Angela Merkel drove out to the forest at Compiègne where, on Nov. 11, 1918, Germany and the allied powers signed the armistice that ended the bloodiest war in history until that moment. Macron tweeted a photograph of himself and the German leader, with a single word caption: “Unis” (United). French television carried more footage of the two moving through the memorial and into a replica of the railway car where the armistice had been signed. At one point Merkel, who herself had grown up under harsh communist rule in East Germany, took Macron’s hand and squeezed it, clearly emotional. Macron put his arm around her. Trump tried to make up for his absence with a hasty trip to the American cemetery Suresnes on Sunday. But it was all too little, too late. While other world leaders gathered in the afternoon to kick off three days of the Paris Peace Forum, Trump was already en route back to America. It was not hard to see why he’d skipped it. The forum represents everything Donald Trump does not. As the organizers described it: “international cooperation is key to tackling global challenges and ensuring durable peace.” The theme, globalism, was reflected in both Macron’s keynote at the Arc de Triomphe and Merkel’s Peace Forum message. Ironically, globalism was also the concept preached by U.S. President Woodrow Wilson throughout the 1919 peace conference that led to the Treaty of Versailles. America needed to stay engaged with the world, Wilson said. It did not, and a few decades later a massive international war was again wreaking havoc across the planet. Today, European leaders seem determined to prevent another tragedy by charting a course independent of the U.S. So why should we care? Trump may preach nationalism, but America desperately needs loyal, determined partners if it is to keep nuclear arsenals out of the grasp of Iran and North Korea; if it is to hold at bay the growing threat of a dangerous Russian-Western arms race; if it is to bring a halt to hostilities in Syria and Yemen that threaten America’s allies and friends across the Middle East; and if we are to bring an end to trade wars that threaten to sap our economic vitality. It is beyond time for Trump to chart a new path, now that he finds himself in a deep hole with America’s long-standing allies. Quite simply, he must stop digging. It is the wisest, perhaps the only, course.